Definition of "thon" from Merriam-Webster&apos;s Second New International Dictionary, 1934. Gender-neutral pronouns have been in the news recently. Last fall, a trans teacher in a Florida school was removed from their classroom for asking students to refer to them with the gender-neutral title Mx and the singular they. Two years earlier, when the Diversity Office at the University of Tennessee suggested that teachers make sure all students felt included by asking them, “What’s your pronoun?”, the state legislature closed the Diversity Office and banned the use of tax dollars to pay for gender-neutral pronouns. It’s only fitting then to remember that the gender-neutral pronoun thon was Word of the Year in 1884. Or it would have been, had we been picking words of the year back then. 1884 was the year that Charles C. Converse announced that he had coined thon, a gender-neutral pronoun, by blending that and one. Thon could refer both to men and women, and it would come in handy in cases where gender is unknown, or irrelevant, or where it needs to be concealed (C. C. Converse, “A New Pronoun.” The Critic, Aug. 2, 1884, p. 55). Thon wasn’t the first gender-neutral pronoun—earlier examples include ou, a dialect word suggested by the Scottish economist James Anderson in 1792; it, suggested by Samuel Taylor Coleridge in 1808; and the pronouns ne and hiser, suggested anonymously around 1850. And it was far from the last. 1884 saw another iteration of hiser, along with ip, se, hi, and le. And later years brought id, ze, jhe, per, E, tey and more than 100 more. Converse, an attorney and hymn-writer from Erie, PA (he was known for writing “What a friend we have in Jesus”), recommends his coinage because it fills three important requirements for a new word: it communicates our thoughts; it does so accurately; and it does so “with despatch.” And Converse feels that his coinage fits the modern aerodynamic spirit of 1884: “The philological atmosphere is full of winged words, the aim, in the making of them, is a minimum of word-body with a maximum of flying power.” Thon avoids the “hideous solecism” of singular they, and the awkward he or she. And Converse is convinced that his pronoun can succeed because it combines two familiar words rather than a new, strange, and arbitrary sign. Converse may have coined thon as early as 1858, after trying other combinations of words that didn’t do the trick, but he didn’t begin promoting thon until 1884, when it prompted much discussion in newspapers and magazines. A few doubters worried that thon would be confused with thou (thou was hardly a common word) and one thought that one would be a better way to fill in the blank in a sentence like “Everyone loves ______’s mother.” Some had better suggestions, like hi, hes, hem (the potential for confusing these with he, his, and him seems greater than confusing thon with the archaic thou). And one even defended singular they, on the analogy of singular you, though most people condemned it as an error. Such a pronoun would undoubtedly be a convenience, did it exist. The difficulty lies in its being yours. All forms of speech have grown, and I do not recall an instance of the use by a civilized race of any word, not a noun or a verb, deliberately invented by a philologer, however ingenious. We have amused and interested ourselves by often using it in the family, in conversation. Beyond controversy, it is a great convenience. . . . If thon is at once received, Mr. Converse will occupy the distinguished and almost unique position of the living father of a new Saxon word for our Anglo-Saxon-English-sentence-building tongue. I wish thon success. On a more optimistic note, thon prompted someone who signed thonself only “Z.,” to ask for another badly-needed word, a title by which a man may address a “lady whom he knows only by reputation”—that is to say, a marriage-neutral alternative to Miss and Mrs. That call would be answered by Ms., which appeared as early as 1901. * As the English language lacks a pronoun for the third person, singular number, common gender, the author hopes he will be pardoned for using the above new word. He also hopes the word will soon become euphonious to many a student in English. Declined: Nominative, thon; possessive, thons; objective, thon; compound, nominative and objective, thonself. Though most users tried thon and then abandoned it, a few die hards held on to thon well into the twentieth century: from the 1950s to the 1970s, the organist and critic Caldwell Titcomb (1927-2011) campaigned to spread the word. Titcomb may have sounded thon’s last hurrah in 1978, when he reminded the New York Times’ Tom Wicker that thon was still a desirable option more than a century after it was coined. After that, thon went dark, replaced by the hipper gender-neutral coinages of the day. 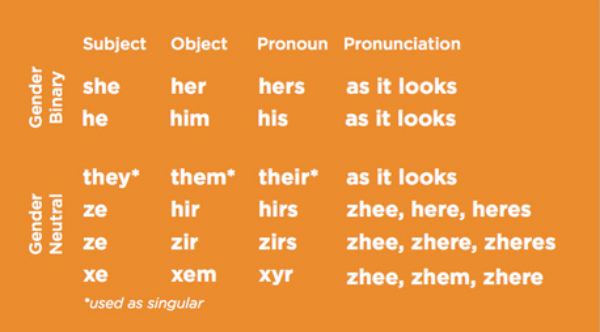 Today when we think of nonbinary pronouns, we think of xe, hir, ze, and they. Some of these are new, but singular they goes back to the 14th century. Unlike hiser, thon, and company, singular they arose naturally, and it’s no longer generally condemned as an error. In fact, singular they was Word of the Year in 2015. But as we contemplate the dismal offerings for 2017 Word of the Year—words that reflect the dismal year that was—it can’t hurt to remember that the optimistic, aerodynamic thon was Word of the Year way back in 1884, one of the bright spots in the last year of Chester A. Arthur's presidency. Or at least it should have been. When the Univ. of Tennessee Diversity Office suggested asking students, "What's your pronoun," giving these examples of pronoun options students might choose, the state closed the Diversity Office and banned the use of taxpayer dollars for gender-neutral pronouns, even though no one knows how much a pronoun costs. Hi. I'm a linguist, retired from the Linguistic Data Consortium at UPenn. Before that I was Senior Linguist for Dragon Systems, Inc., developers of DragonDictate and Dragon NaturallySpeaking. And before any of that, from childhood, I've been a language nutXXXgeek. To those who consider singular "they" a "hideous solecism", I would ask their opinion of singular "you", which has usurped the proper place of "thou".